Standalone 'real hi-fi ' tuners (as opposed to table radios and so on) are getting distinctly thin on the ground these days. No doubt one significant reason for that is continuing uncertainty over whether and when FM will be switched off, so if you're about to spring for a tuner it certainly makes sense to get one that's compatible with both analogue and digital broadcasts. 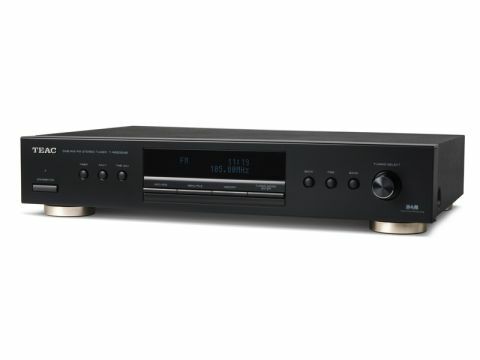 This new model, the T-R650DAB from TEAC is just such a beast. It's actually a full three-band tuner, with good old AM included. And in a further link with the old ways, it has separate FM and DAB tuner sections. This is significant. Many current tuners (especially table radios) have a single tuner which pulls in both kinds of radio signal, doing quite a lot of the FM decoding digitally. That looks good on paper, but we've yet to hear a unit of that type that has really good FM performance. Typically, there's more background 'hash' than an all-analogue tuner provides and performance in the face of the insidious multi-path distortion is compromised. Audio buffering Instead, TEAC uses a typical modern tuner head from KSE, which includes basically the complete RF-to-audio circuit in one little module. The main circuit board carries little more than power supply components, some control functions and the most basic audio buffering. As you'd expect, FM implements RDS and, of course, DAB includes various bits of text information as standard, so there's plenty to look at on the display. DAB's Dynamic Range Control is available and there's a numeric signal strength meter which doesn't tell one much in absolute terms, but is useful for optimising the position of an antenna. Operation isn't quite the same as most other DAB radios as the 'Enter' button is separate from the tuning knob and there's a DAB feature we haven't seen before, manual tuning by frequency. Most users, however, will do as we did and activate the scan and station list functions. DAB tuners don't tend to sound much different from one another, and this one seems to follow that rule of thumb. Actually, we felt it was perhaps just a touch clearer and more open than available comparisons, but really there's very little in it. Its radio-side performance on DAB is also par for the course and we had no trouble at all getting breakup-free reception from a casually draped wire antenna. In other words, this is a good DAB tuner with no ifs or buts. FM is much harder to optimise and here we felt the budget nature of the T-R650 does show a bit. For a start, it's quite fussy about signal strength and wouldn't give us an enjoyable stereo output, however hard we tried with an indoor antenna. We wouldn't expect truly noise-free reception under such conditions but some tuners can at least eliminate the roughest background noises. Fed from our roof-top antenna, the sound improved considerably and background noise decreased to just a little above the minimum one can expect. However, even in this case, the sound remained a little coarse and edgy. At this sort of price it seems rude to be too picky, but we recall better results from cheaper tuners of not very long ago. In terms of actual audio performance, the T-R650 is well-balanced tonally, with good, strong bass and decent treble too. It is at its best with energetic music, where its good rhythmic qualities are best appreciated. For many listeners, DAB may well be the preferred option, all else being equal, with music which majors in subtlety and detail. At the very least, it's good to have the choice!